If you are looking for a vibrant palette of pressed powders to dress up your work look no further. Elisa Griffith, world renowned makeup artist, face artist and instructor created the Color Me Pro Palette. Elisa was born in Italy and is a proud mother of 3. Her work has been featured in The Southern Living Oklahoma Wedding Magazine 2015. Elisa chose her favorite most vibrant pressed powders and combined them in a perfect versatile palette. 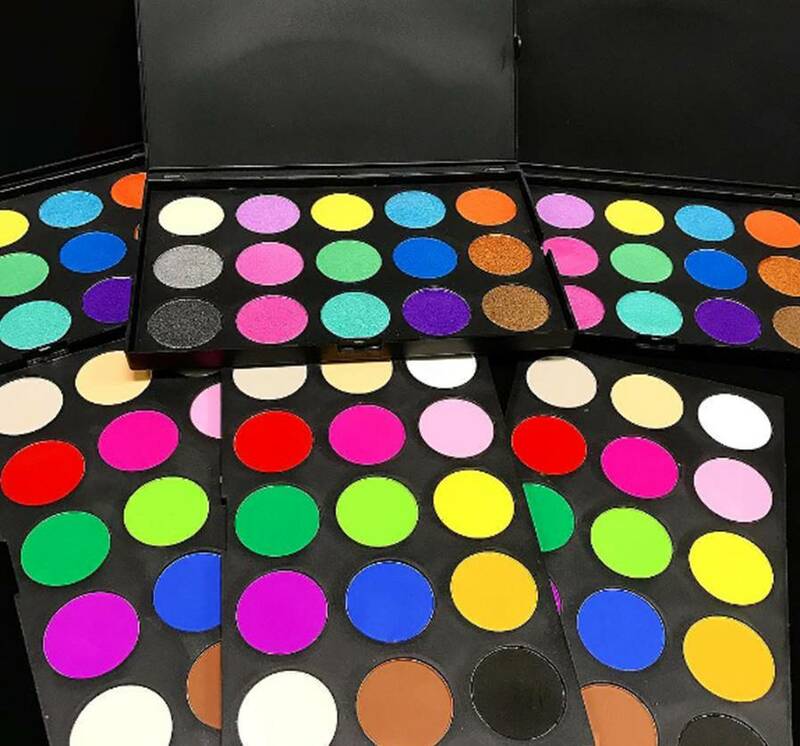 The Color Me Pro Palette contains 14 Matte and 16 Pearl colors; the combination of both matte and pearls makes it a great palette to have in a face painting or makeup kit. Matte colors include white, beige, grey, light pink, pink, red, yellow, light green, green, mustard, blue, purple, black and brown. Pearl colors include white, silver, grey, black, light purple, light pink, dark pink, yellow, green, teal, light blue, dark blue, purple, orange, gold and brown. The powders go on bright and glide on smooth and are great for blending and creating shadows. Pressed powders can be applied over white face paint to ensure a bright application that pops or pearls can be used over your matte face paints to jazz them up. Powders can help keep your design intact for prolong wear during hot summer days when working with sweaty kids. The Color Me Pro Palette is also great for makeup lovers. The mixture of matte and pearls means you can make that dark luxurious smokey eye or a shimmery golden beach look. Beauty makeup, theater makeup, cosplay makeup, drag makeup or just everyday use, this palette has you covered. When you are using the Color Me Pro Palette during face painting or to cover a large area I recommend using a smoothie blender to apply the pigments. Smoothie blenders are able to pick up a lot of pigment for a heavier coverage. For smaller jobs or when you are using powders as eye makeup the Royal petal brushes or other makeup brushes can be used to pick up the pigments. Overall this palette is a great addition to any kit! I really like this product. I highly recommend it.